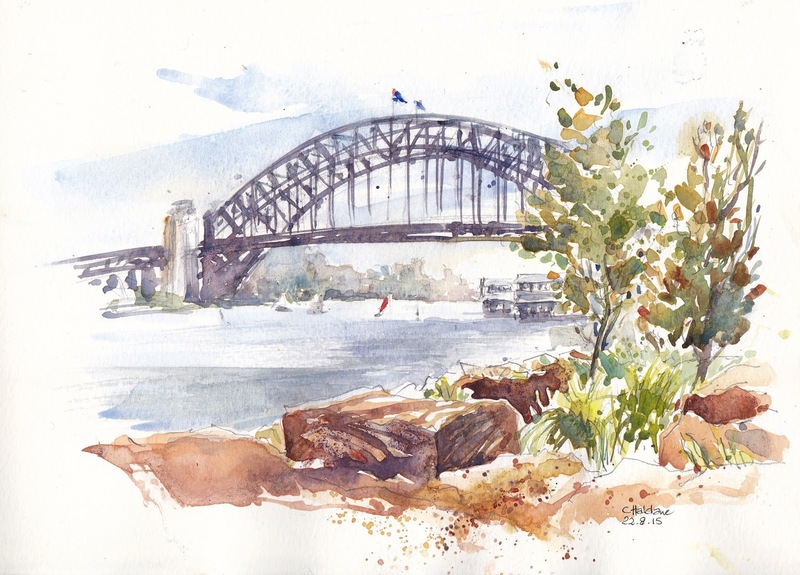 It felt quite special to realise I'm the first person to paint that harbour scene from that lovely spot on those sandstone blocks that now enclose the park, with the bridge in the background. The foreshore was created using 7600 sandstone blocks reclaimed from the site, each numbered and placed in their exact position. The geometry of the way these large blocks have been laid is beautiful, as are the many colours to be found in them, some of which I tried to capture in my drawing. 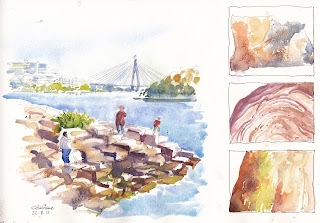 This view looks through to the Anzac Bridge in the background. 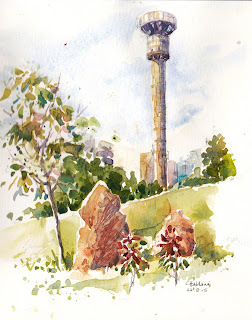 The old harbour control tower can be seen looming over the park from many viewpoints, asserting quite a presence. 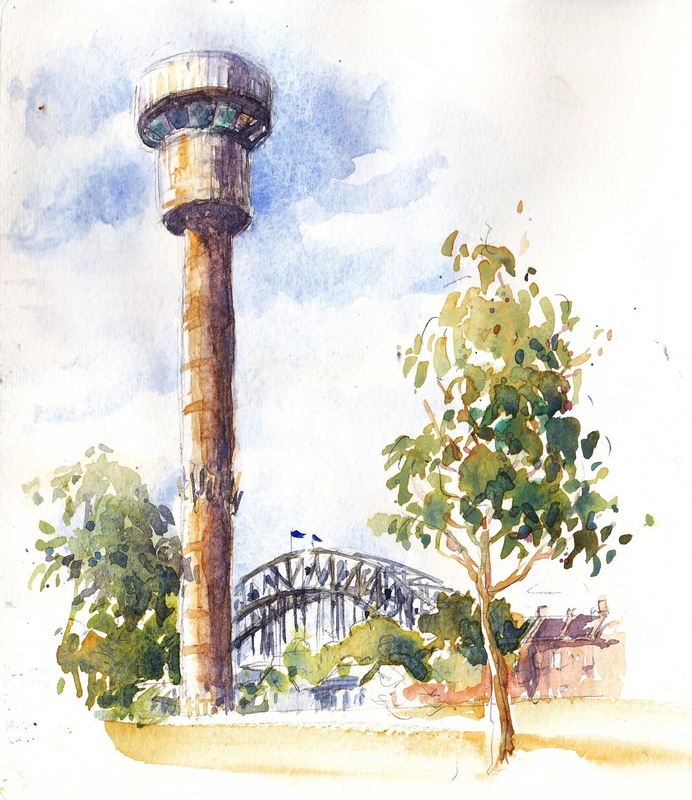 It was built after two ships collided near Millers Point in 1972. 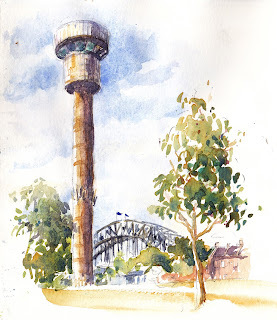 Some have called it "Sydney’s concrete mushroom", and sadly it has now been consigned to demolition, because they say it isn’t in keeping with the natural environment feel of the reserve. But I love it and the way it keeps its eye on the harbour and will be very sad to see it go! This view was from the Burrawang Steps across the Stargazer Lawn, with the Harbour Bridge in the background. 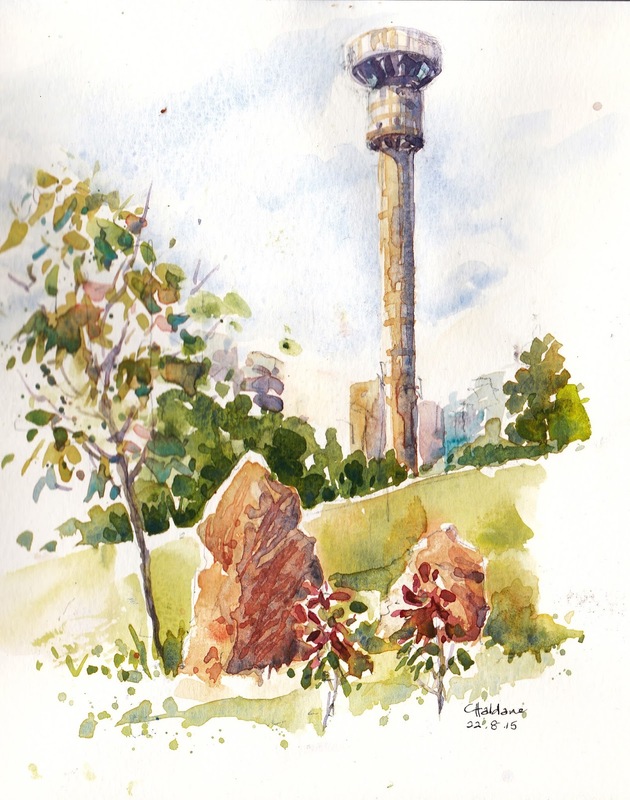 Later in the morning a passerby told me there was someone else drawing around the corner, so sure enough, I found Lionel, another of our Sydney USK gang, drawing this tower from Wulugul Walk! It was great to be part of the opening of this special place and I'm sure it will be enjoyed by Sydneysiders and visitors to our wonderful city alike!